During times when your gym floor turns into a high traffic area roll out your Walkway Runner Mat to offer a layer of protection. Heavy-duty design works in hallways and foyers, and in front of bleachers to reduce the detrimental effects of wear and tear due to hundreds of people passing through. Made of 1/8" thick durable vinyl runner with a corrugated design that promotes safety while also protecting your floor from damage. 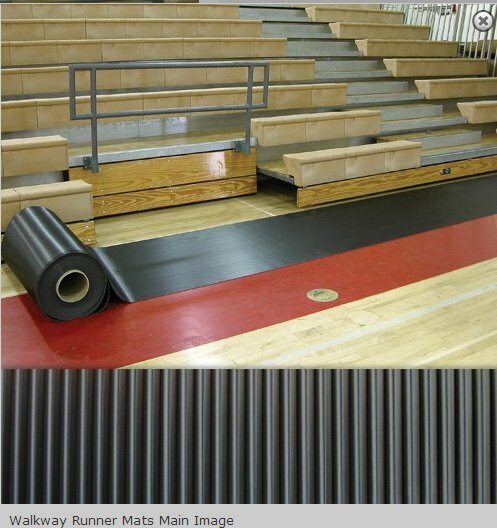 As a coach, the responsibility of maintaining the condition of facilities falls on you, and Walkway Runner Mats are an ideal answer for gymnasium floor cover/protector. Guaranteed to be free of defects in workmanship or materials for one year from the original date of delivery when installed and maintained properly. We agree to repair or replace without charge, at our choice, any product judged defective for either of these reasons and to return the item (or its replacement) freight prepaid. Products that do not have a special guarantee carry up to a one-year guarantee which is honored only when the product is inspected and found to have experienced normal use.